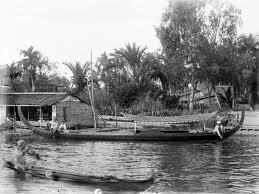 Banjarmasin in the past is city above the rivers, the people has been moved to another places using their jukung and kelotok as their main transportation. Nowadays, its hard to find the situation like this. Due the modernity, most of people use motorcycle and car as the transportation. Both ships are used for alternative if they want to cross the islands or go inside the countryside. And the rest, people who live in the villages outside the city still use both ships. As long as there are rivers, the traditional transportation is still used, but we don't know when it will be over.